Two of Nintendo's most popular puzzle games in one package. In Dr. Mario, you have to clear the viruses from the bottle by lining them up with pill segments of the same colour. Line up four or more of the same colour pills/viruses to clear them. As you progress, the bottle fills up with more and more viruses. 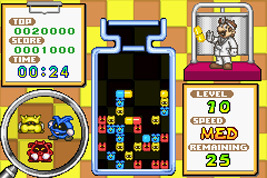 In Puzzle League (known as Panel de Pon in Japan), you have to continuously clear the blocks that rise from the bottom of the screen by lining up three or more of the same blocks. However, you can only switch blocks around horizontally. When you clear a block, you have a brief moment to move some more blocks into place, setting off combos and chains for high points.